This study investigated the coproduction of alkaline amylase and lipopeptides by Bacillus methylotrophicus DCS1 strain, as well as their biochemical characterisation. The best production of both amylase and biosurfactant was obtained when potato starch (10 g/L) and glutamic acid (5 g/L) were used as carbon and nitrogen sources, respectively. The bacterial strain was incubated for 48 h at 25 °C and 150 rpm. This strain produced a unique amylase as showed by zymography technique. The optima pH and temperature were 60–65 °C and 8.0, respectively. Amylase activity was partially inhibited by EDTA (5 mM). The main hydrolysis products of potato starch were maltose and maltotriose. The alkaline amylase showed excellent stability and compatibility with various solid and liquid detergents. Furthermore, the biosurfactant, produced simultaneously with alkaline amylase, demonstrated high stability at different ranges of salinity, pH, and temperature. 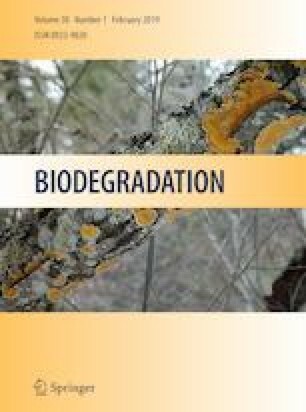 Considering its promising properties, B. methylotrophicus DCS1 crude extract containing both biosurfactants and amylase activity may be considered as a potential candidate for future use in detergent processing industries and environmental remediation processes. This work was funded by «Ministry of Higher Education and Scientific Research-Tunisia».